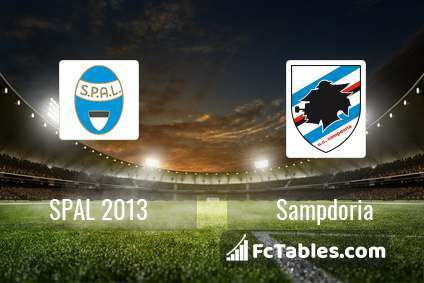 The match SPAL 2013-Sampdoria Serie A will start today 16:00. Referee in the match will be Marco Di Bello. Team SPAL 2013 currently is on lower place in table (17 position). Form team looks like this: In the last 5 matches (league + cup) gain 7 points. The most goals in Serie A for SPAL 2013 scored: Mirko Antenucci 9 goals, Alberto Paloschi 7 goals, Federico Viviani 3 goals. Most goals developed: Mirko Antenucci 7 assists, Alberto Paloschi 1 assists, Federico Viviani 1 assists. In SPAL 2013 not occur in the match due to injury: Marco Borriello, Alex Meret. The match will not occur Thiago Cionek, Bartosz Salamon, Everton because they are suspended (cards, etc.). Team Sampdoria is located in the middle of the table. (10 place). Sampdoria in 5 last matches (league + cup) have collected6 points. Sampdoria did not win the match away from 3 games. The most goals in Serie A for Sampdoria scored: Fabio Quagliarella 19 goals, Duvan Zapata 11 goals, Gianluca Caprari 5 goals. Players with the most assists: Fabio Quagliarella 6 assists, Duvan Zapata 3 assists, Gianluca Caprari 2 assists. In Sampdoria not occur in the match due to injury: Emiliano Viviano, Jacopo Sala, Edgar Barreto. Direct matches: Sampdoria won more direct matches. 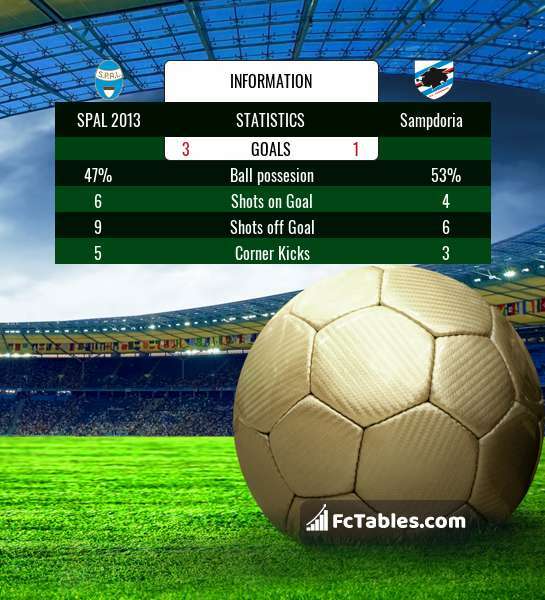 SPAL 2013 won 0 matches , Sampdoria won 1 direct matches, was a 0 draws. In 0 matches the sum of the goals both teams was greater than 2.5 (Over 2.5), and 1 matches teams scored more than 1.5 goals (Over 1.5). In 0 matches the both teams scored a least one goal (Both teams to score).